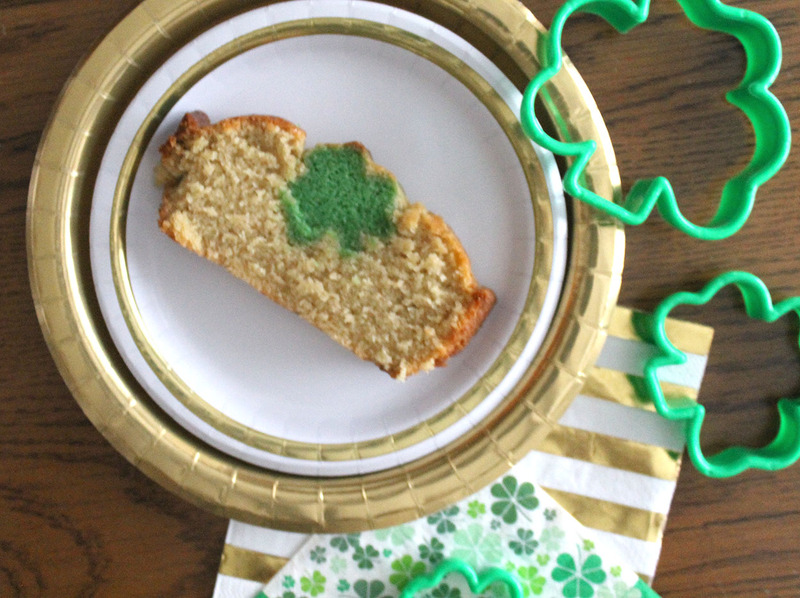 I know this post is titled “shamrock pound cake,” but it started out as “shamrock cupcakes”…yes, I had a Pinterest fail that I thought I would share. For two reasons…first, it is good to see that life is not always picture perfect and I was able to turn the fail into a success (I think). So the fail…I saw some adorable vanilla cupcakes with red velvet heart shapes inside them around Valentine’s Day. 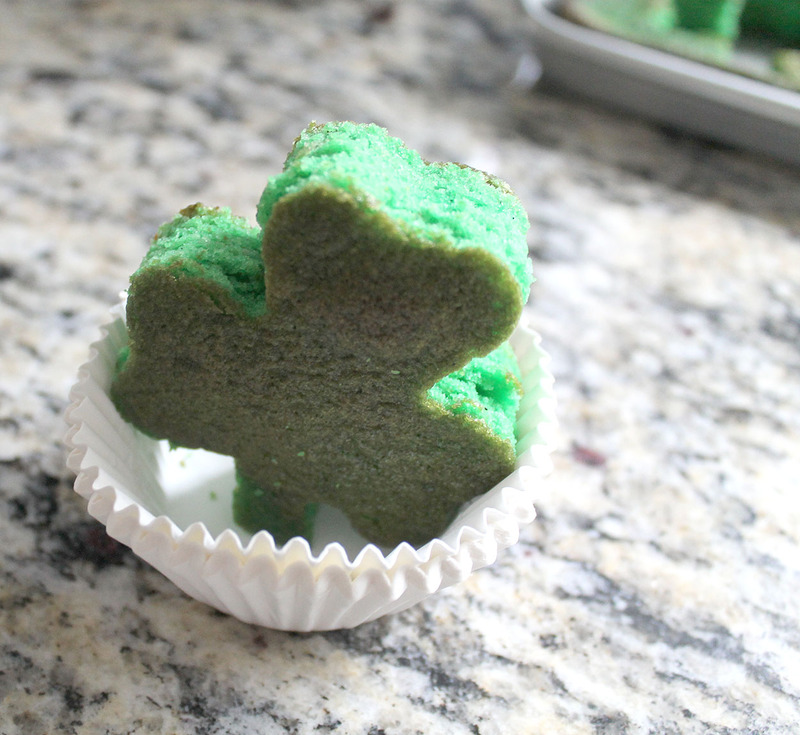 I thought it would be fun to try green shamrocks inside cupcakes. 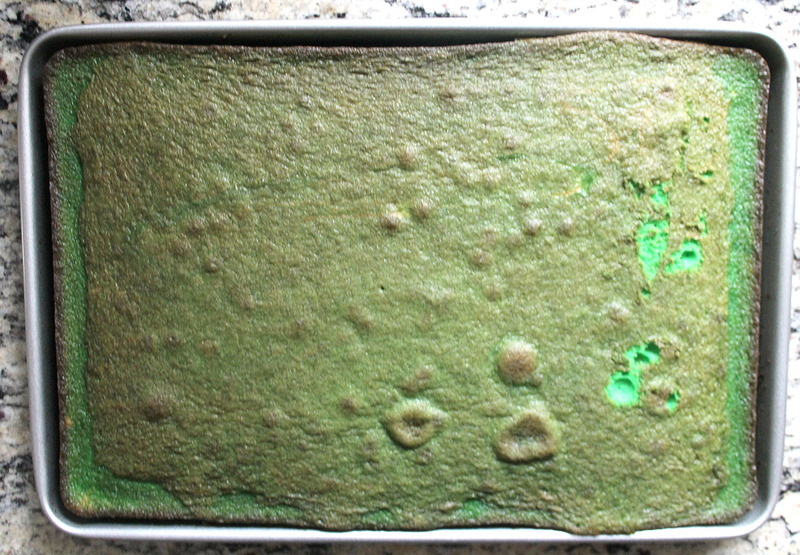 I started by baking a green colored sheet cake. Until I discovered they would be too large for the cupcake liners! Now why didn’t I think to measure before I baked that cake? 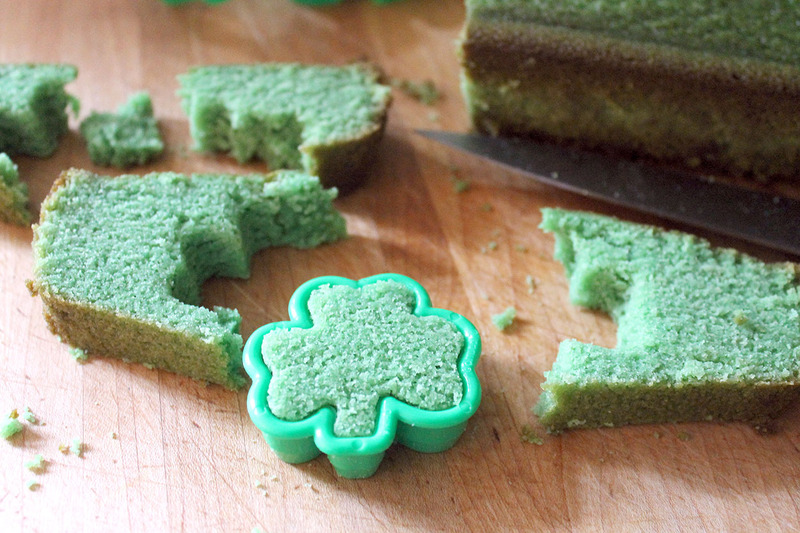 So I had these green shamrock cake shapes, and I didn’t know what to do with them…besides eat them! So I thought I would use them in a pound cake. Surely they would be small enough in a loaf pan. 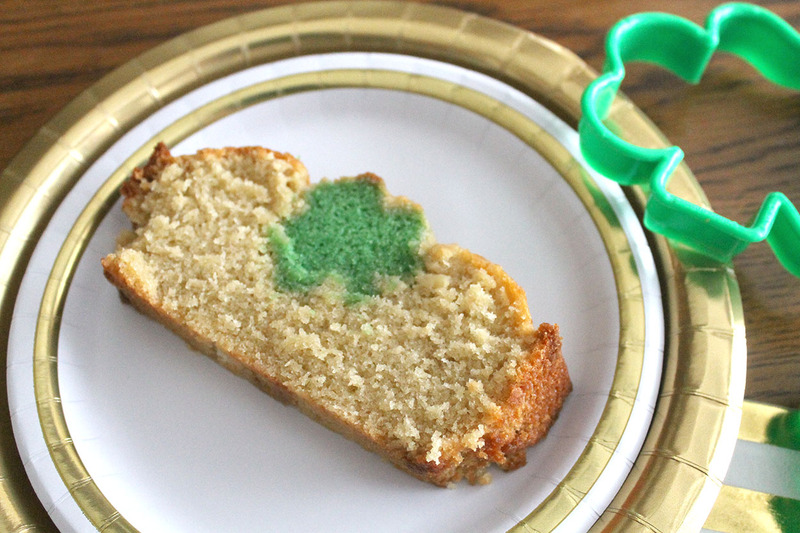 Wrong…because I used a pound cake recipe, the cakes were two different densities which caused my little shamrocks to float to the top as it baked. Not exactly the look I was going for! 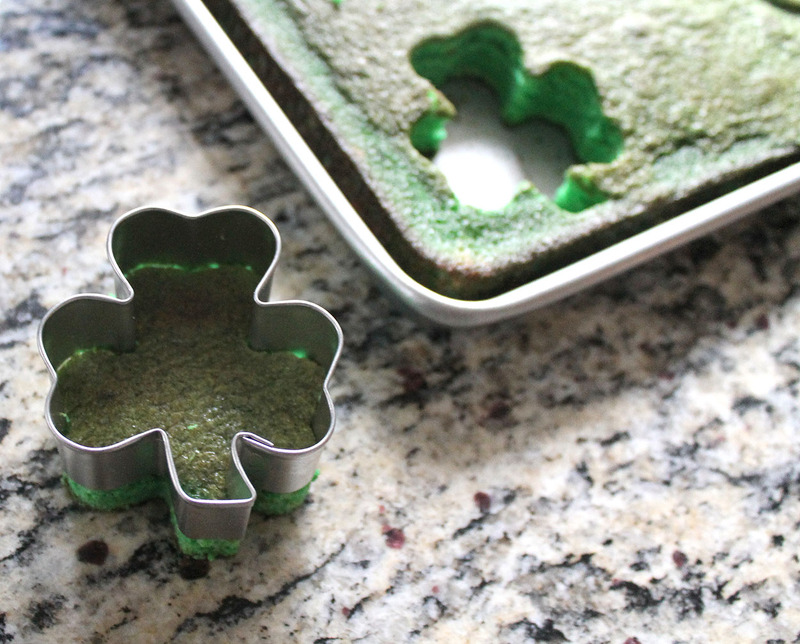 Never one to give up, I decided to try again…only with a smaller shamrock cookie cutter and using the same recipe for both cakes. 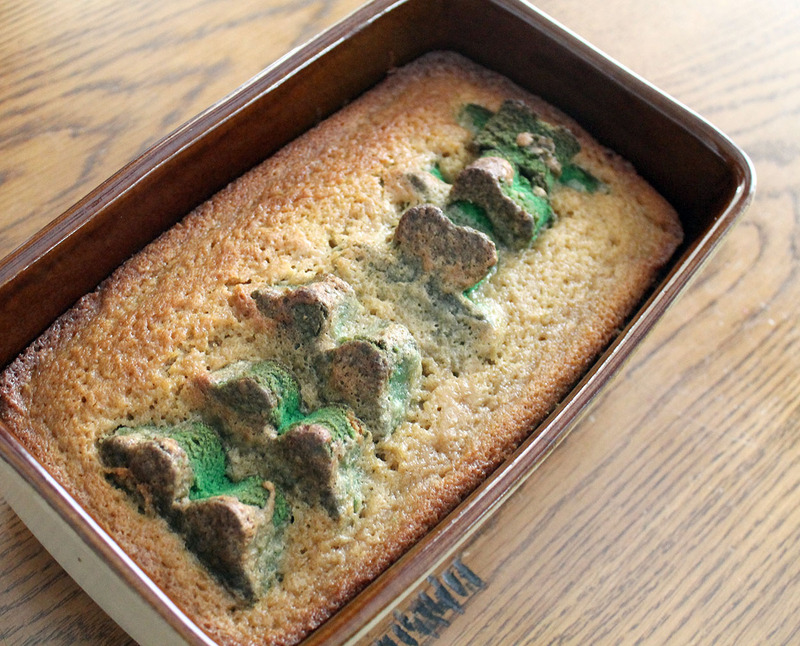 I baked a green pound cake (recipe at bottom) and allowed it to cool. 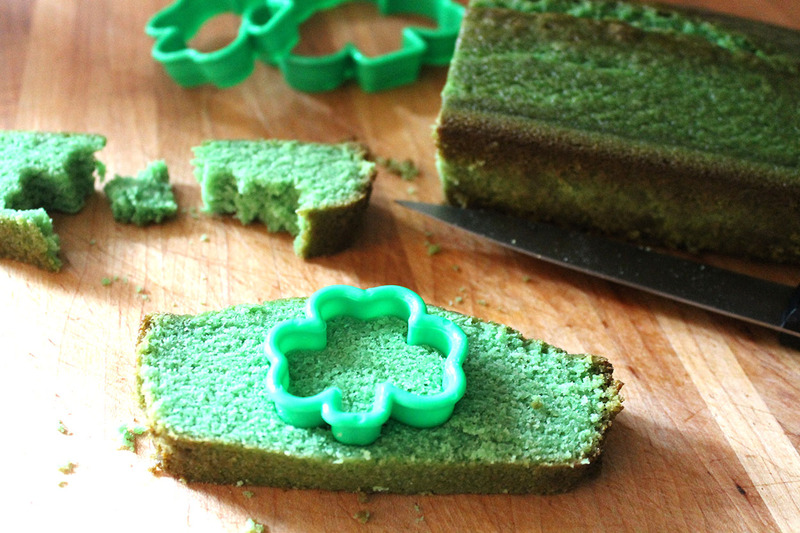 I then sliced it into 1/2-1 inch slices, and cut out the shamrocks with the SMALLER cookie cutter. 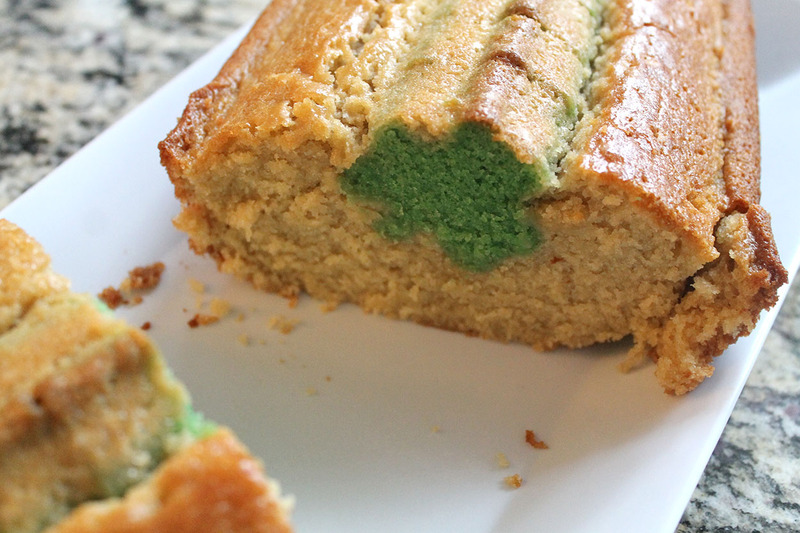 I mixed the ingredients together to make the second pound cake (minus the green food coloring). 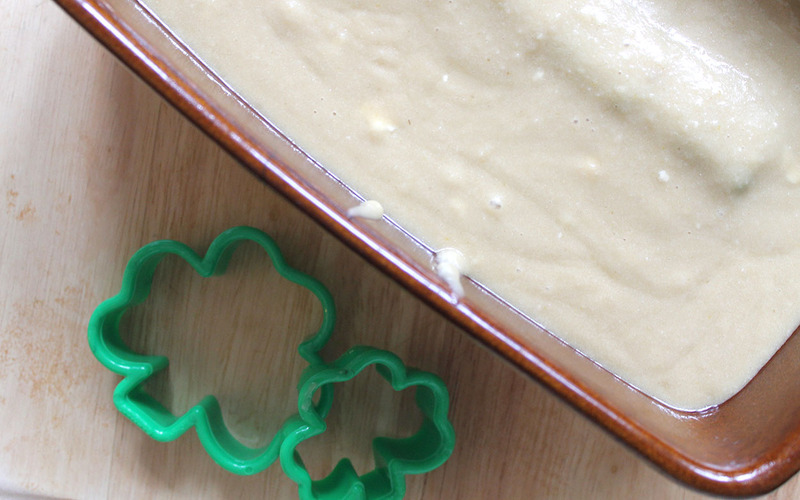 Then, I sprayed the pan with cooking spray and lined up the shamrocks inside the loaf pan. 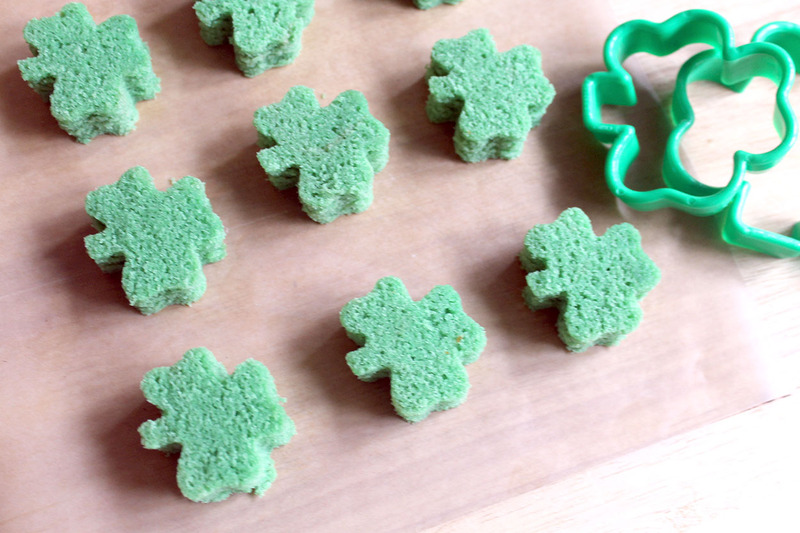 Next I covered the shamrocks with the batter and put it in the oven to bake. Not perfectly centered, but I’ll take it. In a large bowl, beat the butter and sugar at medium speed until fluffy. Add the eggs one at a time. Mix to combine. 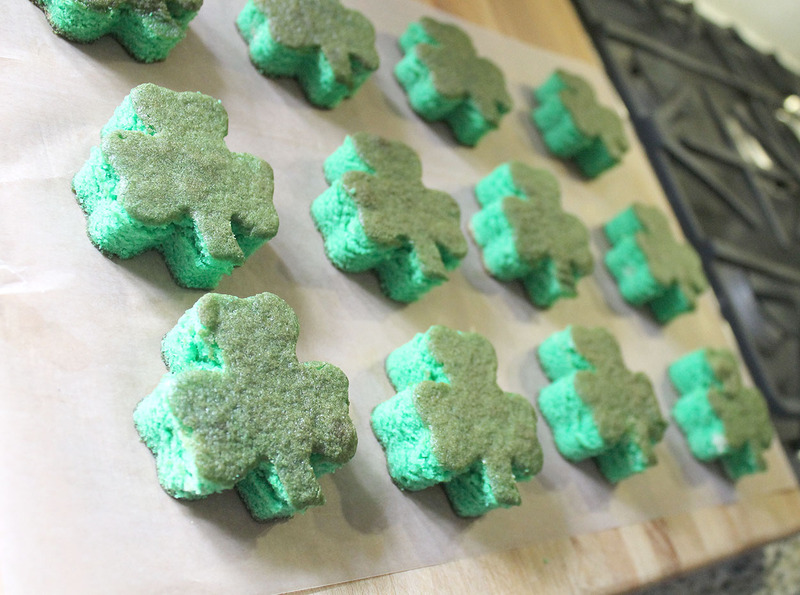 Gradually add the flour mixture to the butter and sugar mixture, beginning and ending with the flour mixture. Beat after each addition. Stir in the green food coloring at this point (if needed). 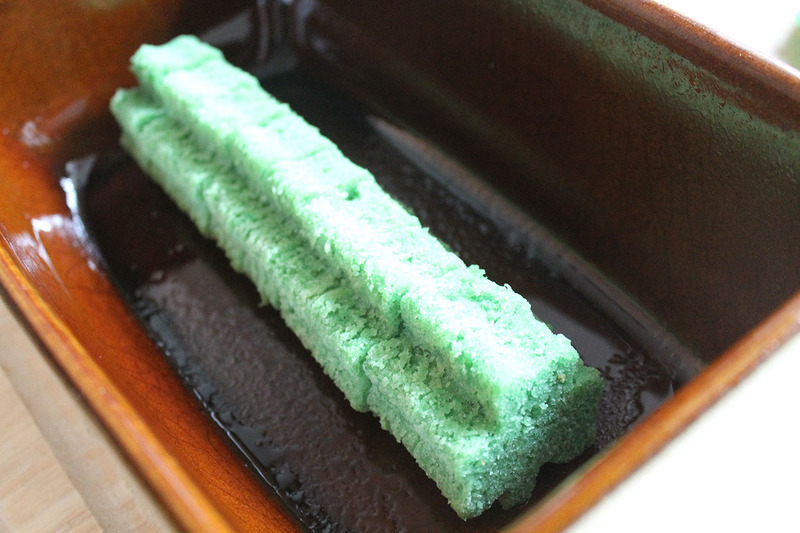 Add the batter to the greased loaf pan and bake at 325 degrees for about 70-75 minutes. Oh my gosh! You kept going much longer than I would have. Looks SO CUTE!!!! The first cake made me laugh!! What a clever way to turn a mistake into a success! It made my girls laugh, too! They still ate it, though.